AS PREDICTED ONE MONTH AGO, ON 14 OCTOBER 2012, FIFTY-ONE PILOT WHALES WERE WASHED INTO THE SAND AT EAST CAPE, NORTH ISLAND, NEW ZEALAND! My alert service informed me only about the two linked events. I knew nothing about the other six until after the beaching on 14 October 2012. My basic concept is that shallow earthquakes cause the rocky bottom to shift about violently. This rapid dancing in the seabed presses against the water column, acting like the faceplate of a gigantic underwater transducer. This action generates a series of rapidly changing pressures tuned to the frequency and duration of the shifting seabed. Strange as it may seem, the intensity of these pressure disturbances, and thus the danger to diving whales, is more related to the speed (aka: peak ground acceleration) of the shifting seabed than it is to the magnitude of the quakes. Roughly 30% percent of the volume of a pilot whale's head is filled with air. It is this air that bounces and channels the returning echos so the whale can determine the azimuth from which the sound comes. The air also serves to isolate the two inner ears (cochlea) so that the whale has true stereoscopic reception, a must for echonavigation and echolocation. Air acts like a mirror to sound waves underwater because of a large difference in acoustical impedance between air and water. If a single whale, or a pod of whales, is exposed to rapid pressure changes while diving, the volume of air inside the sinuses changes in direct proportion to the changing pressure in agreement with Boyle's gas law. If the changes in water pressure are excessive, the sinuses will be injured and the whales will instantly lose their sense of direction, and their ability to dive and feed themselves. Because water is 700 time denser than air, any lost whale, or lost pod of whales, will be turned by the increase resistance (drag) and pointed downstream in the path of least drag; thus, seaquake-injured whales will always swim with the flow of the current. Since current builds beaches, the odds are greatly increased that the pod will eventually be washed into a sandy beach. With this mind, and based only on the awareness of the two linked quakes above, on 17 September 2012, I post a public prediction on Deafwhale Society's Facebook calling for a 30% chance of a beaching. (see a full copy of prediction below or go to Deafwhale's Facebook page). Here's how I came up my prediction: I checked the currents on 01 September 2012.The epicenter of the quakes was near the "50S" on left hand side of the chart. The current marked in red is the Antarctic Circumpolar Current that flows clockwise from west to east around Antarctica. Its alternative name is the West Wind Drift (WWD). As you can see just above 50S latitude, the current starts to swing a little to the north. Lost whales traveling east in West Wind Drift will be shifted slightly to the left of the direction of travel by the Coriolis effect so my best guess was that the pod would drift a little north and maybe enter a filament of current swinging north before they reached Tasmania. In that case, the current would guide them north along the west coast of Tasmania and they might strand on Tasmania or be carried to King Island or maybe to the south coast of Australia. They might also stay in the WWD until they passed Tasmania and then swim into a northern filament and be carried back toward the east coast of Tasmania. Or, they might stay in the WWD, making a break to the north and traveling along the west coast of New Zealand to Golden Bay or maybe be carried to Stewart Island at the southern tip of South Island. If you study the chart above you will see why calling the exact location of the stranding beach is extremely difficult. "Best guess is that there is only a 30% chance of a stranding. The odds are 70% in favor of no strandings." "Where? is another question... the surface currents from the epicenter flow east for a few hundred miles and then branch north toward King Island and the southern shores of Australia. It all depends on whether the pod stays in the eastern flow or takes the swing to the north. Maybe they continue east until they near Tasmania in which case they could go to either the east or southwest coast." "If they continued on with the major flow past Tasmania, they might even enter the Tasman Sea and end up in New Zealand near Stewart Island, or even Golden Bay." "The surface currents are tough to call on this one. I need more data and would be require to update the predictions every other day or so." (1) I did not know know there was eight quakes. You can verify this by going to the quake links I gave in the full prediction below and see that the European data site DID NOT show six of the lessor quakes. Nor did my USGS notification return these six quakes. Had I known there was a cluster event, I would have raised the odds of a beaching to 70% and followed the surface currents on this event religiously. This was not the fault of the stranding solution.... it works if applied correctly. (2) The currents changed and I did not follow up and change the prediction. That the current usually swings north sooner is why a pod stranding at East Cape is indeed rare. The last time it happened was in the late 1980s. Furthermore, this pod was at sea for ~43 days due to their long journey. They were exhausted and near death when they went ashore. This explain why most died as soon as they hit the beach. 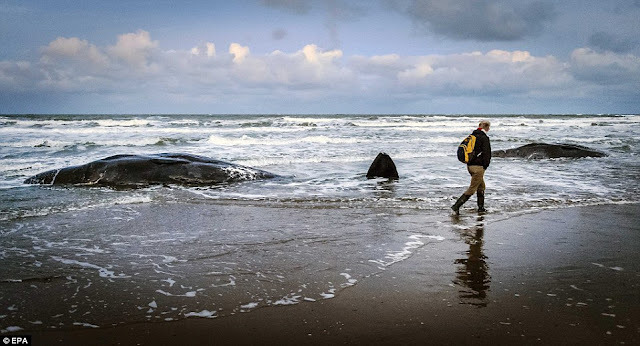 The point is simple... my stranding solution can predict whale beachings but the effort must be closely monitored and the predicted beach updated to encompass changes in the currents. "Two whale-dangerous earthquakes 2,000km south of Perth Australia on August 30 could cause a mass beaching within a few days, depending on where the current carries any injured whales. The quakes occurred after 6 pm, which is a prime feeding time for whales and a period when they are likely to be on a dive. They were in the same spot a few hours apart so the whales could have suffer a double whammy. The quakes are also located in a known habitat for both long-finned pilot whales and sperm whales. The only thing holding these events back from being super dangerous is that the motion in the seafloor was strike-slip (side-to-side or horizontal) verses the most dangerous thrusting quakes. If I could get the acoustic data from the underwater listening station at Perth, I could better judge the danger of these two events. But these guys will not cooperate with me... neither will the Australian Geo folks. I don't know why? Best guess is that there is only a 30% chance of a stranding. The odds are 70% in favor of no strandings. Where? is another question... the surface currents from the epicenter flow east for a few hundred miles and then branch north toward King Island and the southern shores of Australia. It all depends on whether the pod stays in the eastern flow or takes the swing to the north. Maybe they continue east until they near Tasmania in which case they could go to either the east or southwest coast. If they continued on with the major flow past Tasmania, they might even enter the Tasman Sea and end up in New Zealand near Stewart Island, or even Golden Bay. The surface currents are tough to call on this one. I need more data and would be require to update the predictions every other day or so. Here are the two quakes:"